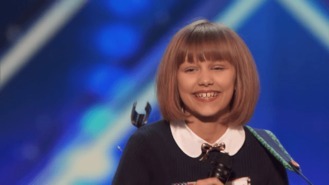 This week’s TV champion is 12-year-old Grace VanderWaal who appeared on America’s Got Talent. The young woman stood on stage with her Ukulele and performed her own song “I Don’t Know My Name” in front of a huge audience, big enough to make even the most respected artists nervous. After the performance, Cowell said that she could be “the next Taylor Swift.” Viewers were quick to note that, not only were the lyrics and style very close to Swift’s older days, but her hairstyle was indeed very similar to the superstar’s. In the end, it was judge Howie Mandell who put the singer through, deciding almost instantly to press the Golden Buzzer, putting the 12-year-old through to the next stage. Earlier this month, Cowell confirmed the judging panel for the UK’s X Factor, bringing back some very familiar faces. Ant and Dec have told the bosses of the BRIT Awards they will not host the music ceremony next year. The Germein Sisters would like to see more female artists headlining festivals. Mariah Carey's estranged husband has laughed off reports suggesting he's stalling on signing the couple's divorce papers. Kylie Minogue's actor boyfriend Joshua Sasse has poked fun at rumours suggesting the couple secretly tied the knot in Greece. Singer Axl Rose fears an in-demand autobiography will upset his Guns N' Roses bandmates. There could be a posthumous Prince and Missy Elliott duet in the vaults, if only she could find it. This week’s TV champion is 12-year-old Grace VanderWaal who appeared onAmerica’s Got Talent. Bobby Brown regrets "so many things" about his parenting of daughter Bobbi Kristina Brown. Country music star Blake Shelton was lost for words while viewing his new exhibit at the Country Music Hall of Fame.